Liu Peng is an artist and a curator. 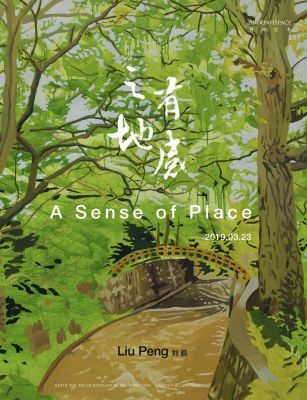 AroundSpace is pleased to present millennial artist Liu Peng's solo show in the beginning of 2019,A Sense of Place, showcasing the young artist's most recent works. Describing himself as "an archeologist with a camera," American photographer David Plowden took a series of pictures that documented the disappearing landscape of small town and rural areas in the Midwest in the mid-1980s. This project resulted in a photo album titled A Sense of Place, which touched viewers and evoked their sentiments and nostalgic feelings even if they had never been to those places. Today, Chinese artist Liu Peng encounters landscapes in the cyber world, including natural mountains and forests, and man-made tennis courts and swimming pools. He selected those places and images that connect to his inner self and made paintings out of them. Like American artist Alex Kartz, and British artists David Hockney and Peter Doig, Liu Peng resisted the temptation of the most popular post WWII style--abstract painting. Instead, he made figurative painting his primary media, and never stopped exploring or bringing it to the next level. In the paintings shown in the exhibition, landscape is only a vehicle. Liu Peng did not portray a particular place in a particular time period. He drew inspiration from the internet, printed media, even his own imagination, breaking these images and reconstructing them with his individual thoughts and perspective. Compared to his earlier works, these paintings show that Liu Peng's artistic skills have been significantly improved, in the way he arranges the composition, color scheme and brush strokes. He successfully breaks the narrative convention of figurative painting, and dedicates himself to exploring and innovating the basic nature of painting. Central Park, one of the Landscape of this Momentseries, has a spring-like high saturated and bright palette, reminding us Hockney's recent iPad paintings. While in the series of On the Way of Viewing A Tennis Court, Liu blended different time and spaces in one canvas, creating a deja-vu mood by orchestrating the figures, colors and lights. Hockney's subject matters come from his life and friends, while the landscapes and spectacles on Liu's canvas come from the internet rather than the real world the artist lives in. However, in 21st century, we seem to depend on and co-exist with the internet more than we connect with the real world. In this point of view, those seemingly familiar yet unknown "cyber landscape" may be more real to us, and can easily move us and remind us "a sense of place" deep inside of our memory.